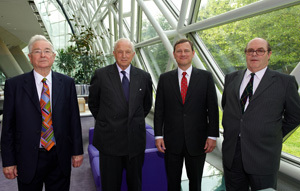 On Friday 8th May 2009 the Centre for Public Law held the ninth in the series of lectures in honour of Sir David Williams. The lecture, entitled "Abraham Lincoln and the Supreme Court" was given by The Honourable John G Roberts Jnr, Chief Justice of the United States. Professor Timothy Endicott, Dean of the Faculty of Law, University of Oxford gave a talk entitled "The United States Supreme Court and Guantànamo Bay: Three strikes". He discussed his paper 'Habeas Corpus and Guantánamo Bay: A View from Abroad' (http://papers.ssrn.com/sol3/papers.cfm?abstract_id=982412), updating it to deal with the third USSC decision, Boumediene. The talk will took place on Monday 26th January at 6pm in the Institute of Criminology. The Hon. Margaret Wilson DCNZM, gave a lunchtime talk entitled "The role of the Speaker in a MMP Parliament". The talk took place on Thursday 12th February at 1pm in the Law Faculty. Tom Poole, Senior Lecturer at the London School of Economics & Political Science gave a talk entitled "Which Empire? Law, Imperialism and the Chagos Islanders' Case". The talk took place on Thursday 5th March at 6pm in the Law Faculty. Professor Arthur Hellman (University of Pittsburgh, School of Law) gave a lunchtime talk entitled "Independent of Whom? Judicial Independence, Individual Rights, and Democratic Self-Governance". The talk will took place on Thursday 30th April at 1pm in the Law Faculty (B16). The Centre ran a series of workshops to showcase work in progress projects of Graduate Students with an interest in Public Law. If you are interested in taking part in future workshops, please contact Dr Amanda Perreau-Saussine (acrh2@cam.ac.uk). Thursday 7th May: Dominic de Cogan gave a presentation on: "Tax by law or by administrators: the changing boundaries between 1900 and 1950." Thursday 28th May: Jessie Hohmann gave a presentation on: "The right to housing: issues in the public/private"
Thursday 4th June: Paul Daly gave a presentation on: "Jurisdiction and Law: Inappropriate Organising Principles in Judicial Review"